Finally, we are ready to launch this great feature. Are you ready for a story starring you? Or would you like to give someone the unique gift of a story starring them? Well, at this inaugural event, you can have one. For just $19.99 you can come, fill out a questionnaire, and Troy Lambert, thriller author will write a story just for you, starring you and your interests. Want to be the hero? The bad guy? Want to pick the setting and what you do for a living or what your dream job is? You get to decide. Then you get a one page signed story written just for you or the person you choose? 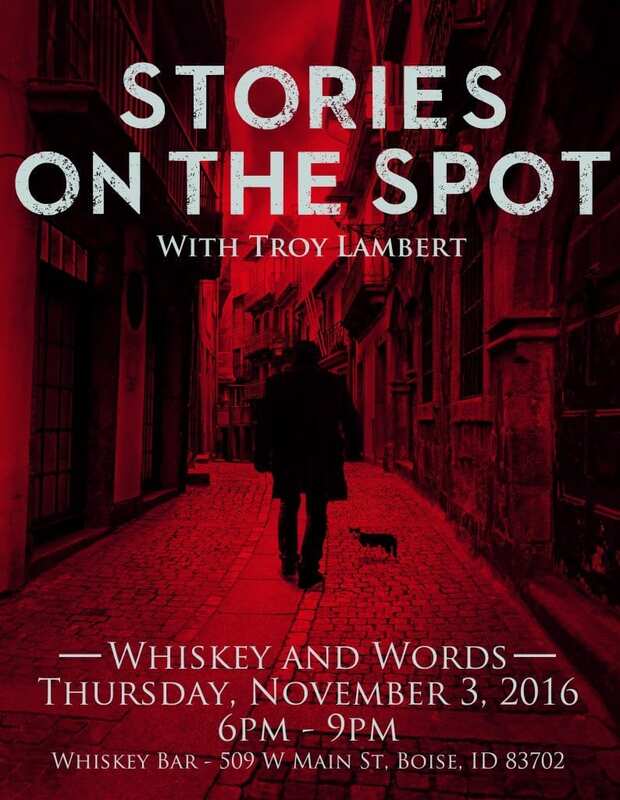 This first event will take place at Whiskey and Words here in Boise, Idaho, the first Thursday in November at Whiskey Bar. Interested in hosting an event? Can’t attend, but want to get a story anyway? There will be some Story on the Spot Online events coming soon! I hope you can make it in November! It will be great to see you all.